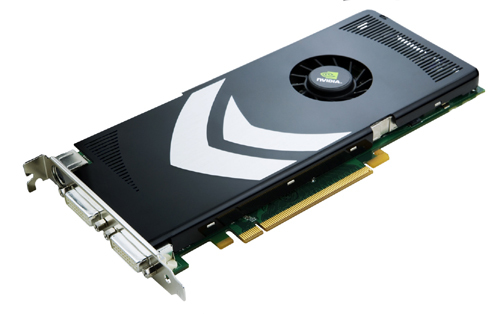 GeForce 8800 GT – The card everyone’s been waiting for? … but what I want is a card that combines the HD acceleration (PureVideo HD or AVIVO HD) of the 8600 GTS (or HD 2400 XT) with the 3D performance of the 8800 GTS. Again, waiting 6 months will probably make this possible. Well, I didn’t have to wait 6 months (although 6 months from the day that the 8800 series was first announced is more accurate), Nvidia has just announced the introduction of the 512 MB 8800 GT. So what’s new in the 8800 GT? The 8800 GT has a new GPU, the G92. It is essentially a die shrink of the existing G80 GPU as found in the other 8800 series cards. 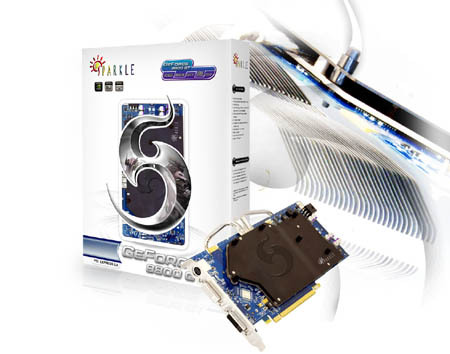 The G80 required an external display chip to support the dual-link DVI outputs, but now the display chip is integrated into the GPU which significantly reduces manufacturing costs. The new GPU also supports PCIe 2.0, which doubles the available bandwidth. There are also lots of little changes associated with 3D performance, things like 112 SPs (compared to the GTX’s 128 SPs, and the GTS’s 96), core clock increase to 600 MHz (a 25 MHz increase on the GTX, but 12 less than the Ultra), shader clock at 1500 MHz (sames as the Ultra, and higher than the GTX), a 900 MHz memory clock (sames as the GTX, lower than the Ultra), 512 MB of RAM and a memory interface of only 256 bits (compared to the 384-bit of the Ultra/GTX, and 320-bit of the GTS). But forget all these specs, the important thing is that the GT plays the latest games and do it very well, basically on the same level as a 640 MB 8800 GTS, the card that I recommended only a month ago. I have deliberately left out the best bit, and one bit that the 8800 GTS/GTX/Ultra was missing, which led me to be cautious in my previous recommendations. Where this feature is concerned, even the 8600 GTS was more preferable than the 8800. So what is it? Well, since this is a website/blog mainly about digital video, the feature I’m talking about is HD video acceleration, in particularly VC-1 and H.264 acceleration needed for HD DVD and Blu-ray playback. While the 8800 Ultra/GTX/GTS was super powerful for 3D gaming, it did not contribute much to video acceleration at all, and instead, sat idle while the CPU struggles to keep a steady framerate. With the 8500/8600 and now 8800 GT, the VP2 engine is used to provide full H.264 video decoding. Note that VP2 on the 8500/8600 only offers full H.264 acceleration – MPEG-2 acceleration (not really needed) and VC-1 acceleration is limited to only inverse transform, motion compensation and in-loop deblocking – I’m not sure if the situation has changed with the VP2 engine on the 8800 GT (unlikely), but H.264 is the most processor intensive codec of all three and the one that is most in need of acceleration. Full VC-1 acceleration would have been great, as most HD DVD movies and now even Blu-ray ones use VC-1, but I guess we will have to wait for the VP3 engine for that. So my wish sort of came true. I wanted a graphics card with the 3D power of the 8800 GTS, and the HD video acceleration features of the 8600 GTS, and this is exactly what I’ve got in the 8800 GT. There’s even a passive cooled version of the 8800 GT, perfect for a HTPC setup that can even handle the latest games (a sort of “build-your-own” Xbox 360/PS3). The price is right too, positioned as an even cheaper replacement for the 320 MB 8800 GTS. It will be interesting to see what ATI can come up with to compete with the 8800 GT. And Nvidia themselves will launch a new GTS in November, so it might be worth it to wait and see a bit longer. And if you want to be a perfectionist, you might wish for HDMI output as well. But for the present, the 8800 GT is the GPU that I recommend for gaming and video enthusiasts. For a roundup of Nvidia’s range of GPUs, please refer to this forum thread. You can read a full review of the 8800 GT here. This entry was posted on Wednesday, October 31st, 2007 at 5:39 pm	and is filed under Computing, Video Technology. You can follow any responses to this entry through the RSS 2.0 feed. Both comments and pings are currently closed.